I'll let you in to a bit of a secret...I am one of those 'collectors' that gets a bit obsessive. I have a deep love for clockwork creatures. Not any creatures, but those ones that are 'in need of TLC' or 'Not working'. I tend not to pay too much, so I'm only interested in rescuing. 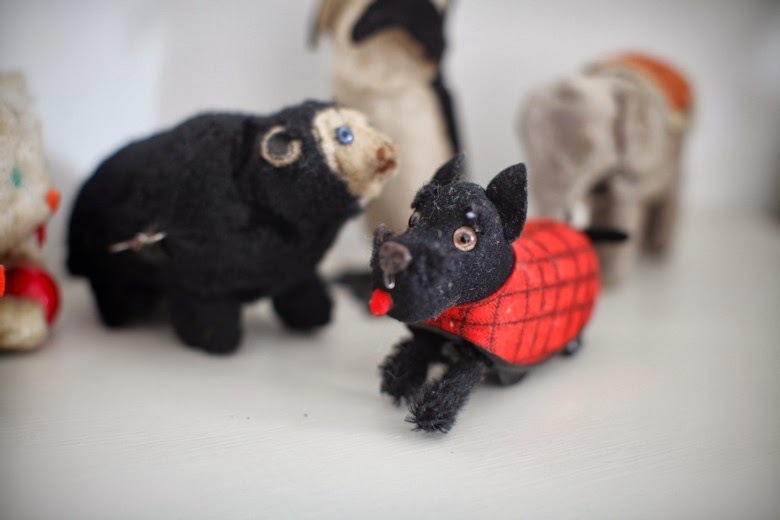 Each of these creatures has a story about how I found them, and where they are from. Not just that, but most of these toys are made during the 1950s in countries that were occupied after the war such as Germany and Japan. The craftsmanship is amazing, and I suppose it was considered a safe way of keeping countries capable of producing world class fighter planes and ammunitions etc, was to make them produce clockwork toys instead. Whatever, I don't know too much about it but I think these toys have bought generations of fun and amazement which is nothing to be sniffed at all. This Scotty dog was made in American Occupied Germany, the bear is also made in Germany. ...this lovely elephant. She is made in Japan in the 1950s and cost me just a few pounds. It was advertised as 'not working, no key' so I thought I'd offer her a home. She is missing one ear, one eye and a tail. When I opened the packet (from ebay) I heard the creak of the mechanism which gave me hope that she might actually work. I found a key from another toy that fit, and when I wound it up, she moved her head and waggled her ears as if just waking up from 40 odd years asleep. I was so excited, its embarrassing. So I dug out my sewing machine oil and put a few dabs inside and now she's quite energetic and even walks and sways her head all the time. small things like this make me so happy. So now I am thinking to make a replacement ear because she seems to really want to flap them. My collection is growing, and I am thinking to put them in a glass cabinet for our little'un. She loves watching them and starts growling like the bear! *Of course I am not going to let her play with them until she is older. I feel sad that I have to state the obvious, but there you go. 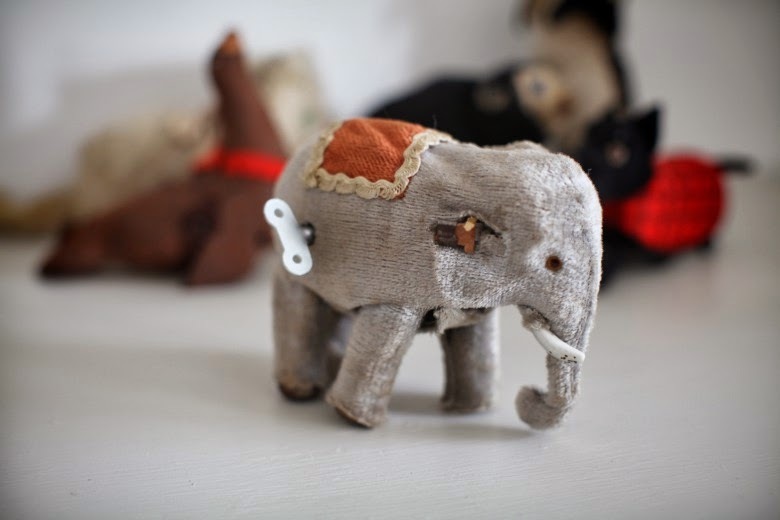 The little elephant is just so cute, what wonderful things to collect. This is such a neat post! What special toys. I am always glad to read your posts because i feel a little bit less alone in my obsessions. I always always felt sad for little stuffed animals that were neglected, even as a very small child. That was the first sign my parents should have noticed about what I would have become as an adult - a pets rescuer. 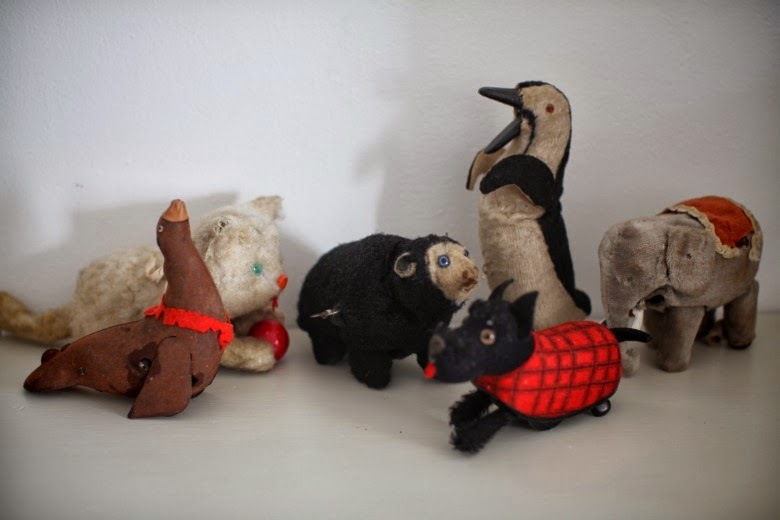 I have very old stuffed animals and I am always working on them, making them clothes and patching here and there...I will never ever throw them, because they can tell stories. These are really sweet finds Artemis, i can understand your excitement about the elephant! Do you think you'll give her a new ear? That little bear has attitude..! 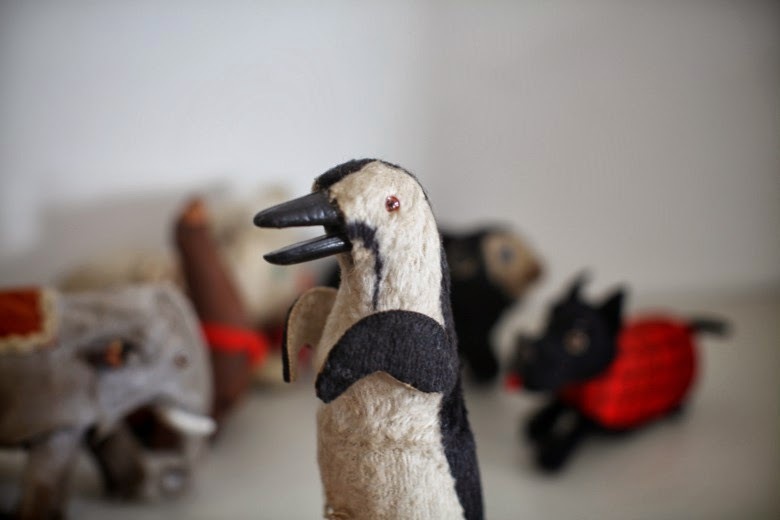 An amazing collection - and they have found the right home.. These are great! I can't help myself from collecting various types of toys and I don't even have the excuse of a child! Lucky Pehr to have these to watch. I have a growing collection of slope walkers which largely fall over but they make me smile! Oh I love these little things! I only have one so far (a pig) but I'm always on the look out for others! The bear kind of reminds me of a character from the Studio Ghibli film 'Spirited Away'. Coincidentally I just saw this picture on Mouses Houses and thought you might like it! 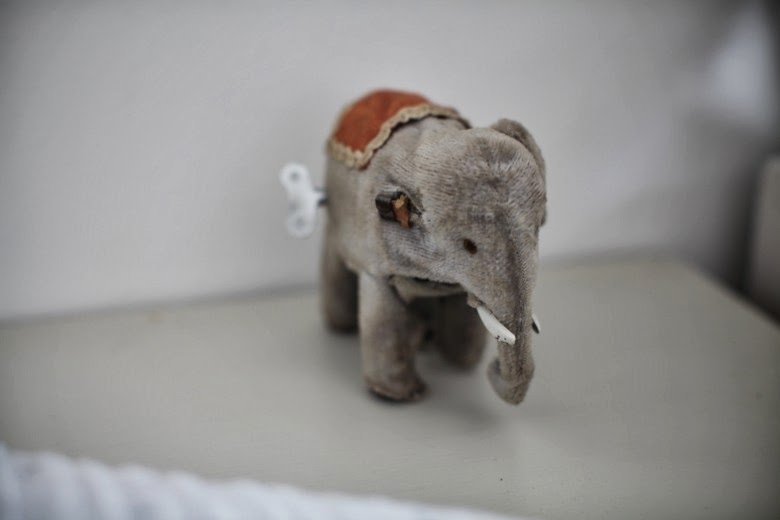 As a Creature Maker and fellow collector I share your excitement, even I was excited reading about the Elephant working!A lovely Collection, and one day Pehr will love and treasure them just as much. OMG! They are the cutest ever! I love the bear and would love to see the elephant in motion. How charming that he works, despite the damage he has sustained. Can't wait to see more. What a cool collection for Pehr. what a magical little collection :) , well rescued! Your little one is so lucky. These are amazing, I totally get why you'd want to save them! And the bear actually moves like a real bear. Aww I really love these and could completely see why you'd want to rescue them. Since I was little I've always loved the toys that are broken, if they have missing ears, eyes too small for their head or are wonky or weird looking in any way you can guarantee I'll want them. From your collection I especially love the elephant, he is so very cute! Love the way the bear walks too, would love to see other videos if you even do decide to share them. Have you read The Mouse and his Child, by Russell Hoban? It is the story of clockwork toys and their quest to find their way back to the dolls house where they had once lived. I think you (and later Pehr, too) might like it. wow, how the bear moves! came to this late but wow so worth it! what can i add except: "magnificent obsession!" oh that elephant! p.s. too late too to say i loved the most recent "new header". now it's gone, but sure you'll come up with something just as nice! What a lovely collection and I'm sure it's sometching your daughter will treasure when she is older. There was a time when I used to come across these wind up toys a lot but not so much anymore. Have you come across the tin windup toys?? amazing.. i really adore your blog! I love the elephant and penguin!